NEWSFLASH: John Edwards Cheats On Woman He Cheated With! 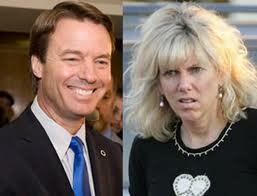 Disgraced former Senator and Presidential nominee John Edwards is in big trouble with his baby mama Rielle Hunter. She’s reported infuriated about rumors that Edwards spent an evening with a high priced call girl back in 2007 - during the same time Rielle was carrying the love child he conceived while cheating on his cancer-stricken wife, Elizabeth. - Can you blame her? I mean he SWORE he wouldn’t cheat on his wife with anyone but her! - To get back at him, Rielle did the ultimate no-no: She messed up his hair.